Metaphorically speaking, it was our guts that lead us to Madrid instead of Barcelona. That worked out pretty well for us, so it is only fitting that once there, we continued to let our stomachs guide us, and in doing so, did our level best to eat our way through the city. We knew next to nothing about Spanish food (other than a few buzz words like “tortilla” and “paella”) prior to our visit, but came with open minds (and growling stomachs! ), ready for some hands-on learning. Our intention on this visit to Madrid was to take advantage of tapas and small portions as much as possible so that we could try little bits of lots of things. Having had our fill of overpriced meals elsewhere, we were really looking forward to seeing how well (and how much) we could stretch our food budget… and our stomachs. After doing a little bit of research into local street food, I knew exactly what I wanted our first taste of Madrid to be and just where to get it. So, after dropping off our bags at our awesome apartment in the hyper-local Trafalgar neighborhood, Tony & I made a beeline for the city’s center, the Plaza Mayor. Most tourists head here to eat overpriced meals looking out onto the square, but those in the know do as the locals do and head to the side streets where there are tons of little restaurants and bars selling the city’s most popular snack, the bocadillo de calamares (aka fried squid sandwich). Practically every restaurant bordering the exterior of the Plaza Mayor serves up these babies (we found this map helpful), but we got our fix at Cerveceria La Campana. At just €2,70 (~$3US), they are a really filling and satisfying meal for very little money. Although the sandwiches are traditionally served unadorned, we asked the guy behind the bar if we could have some salsa roja (mildly spicy tomato sauce) to squirt on ours. Based on the slightly confused look we got from him, clearly the local mentality is that you don’t need much to make a heaping pile of freshly fried squid taste good, but we felt the little bit of spice made the sandwich even better. Sure, most of the locals looked at us like we were kind of crazy, but we also caught a few creeping up afterwards to do the same to theirs! Alongside a caña (small glass of beer) and a free dish of olives, this was an excellent meal to welcome us to Madrid! Next up on our Spanish food hit list was some of the lauded local pork products. Having read about the near-magical properties of prized Iberian ham (jamón Ibérico), we made our way to the aptly named, Museo del Jamón, to taste some. Iberian ham makes up just 8% of Spain’s annual ham production and has only recently become available in the United States where its rarity means it sells for upwards of $52/lb! Because of Museo del Jamón’s affordable lunch specials, we were able to order a platter of Iberian ham and a plate of pâté and Manchego cheese. The ham was dense, not unlike a jerky (likely due to the lengthy 24-month ageing process), but also silky and buttery on the palate. It didn’t quite melt in our mouths, but it wasn’t far from it. The flavor was quite strong rather than delicate, something I would simply describe as concentrated porkiness (a piggy punch to the mouth?). 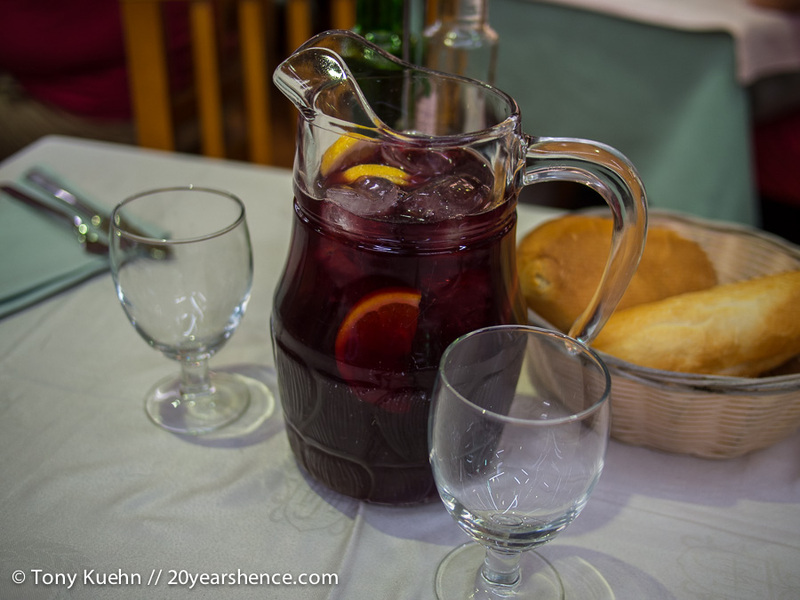 If you want to try tinto de verano at home, it couldn’t be easier! Essentially mix equal parts red wine—cheap is fine!—with a lightly sweetened citrus soda (we like to use Fresca) in a pitcher, throw in some lemon slices if you’re feeling fancy, and then pour over ice. 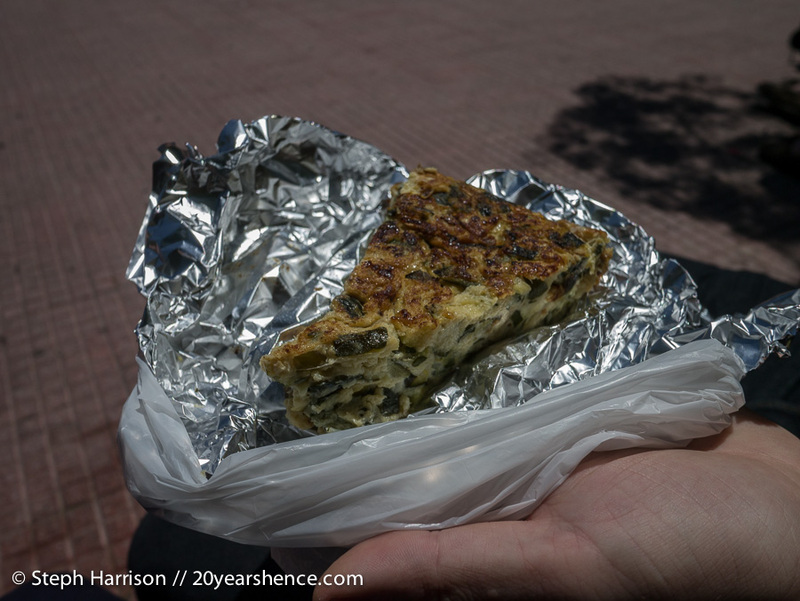 The last “must-eat” item on our Madrid food list was an authentic Spanish tortilla. Unlike their Mexican counterparts, tortillas in Spain refer to what is essentially a thick egg omelet (think of a crustless quiche or a frittata and you’ve pretty much got it), that can be served either hot or cold, and can either be quite firm or rather runny. Traditionally tortillas include thin slices of potato in them, but our AirBnB hosts recommended a nearby restaurant that made a variation that used zucchini (calabacín) instead and, in their humble opinion, was the best tortilla in the city. We went and ordered a huge honking slice of tortilla de calabacín and then went and ate it in front of fountain in a neighboring plaza. For most, Spanish tortilla most properly seems like it would be a breakfast dish, but it’s more often consumed for lunch or as a tapa in Madrid. Instead, locals turn to sweeter fare to start their day, and so did we. Heading to famed local establishment Chocolatería San Ginés which is open 24 hours a day, we split an order of the unofficial breakfast of Madrid: Churros con Chocolate. Long sticks of slightly sweet dough are deep fried and then eaten alongside a mug of thick hot chocolate. Rather than sipping the chocolate, you instead dip pieces of your churro into the slightly bitter dark chocolate (which is really a tarlike syrup). It’s utterly decadent, not unlike having dessert for breakfast, and without caution can teach you the truth of “too much of a good thing”. We so enjoyed our split order that the next time we went out for churros, we each ordered our own portion. What a mistake! It’s such a rich dish that neither of us could finish a full serving on our own and then felt greasy like we had rubbed a carnival on our faces and were vaguely queasy for the next few hours. Consider yourselves warned: with churros con chocolate, moderation is key! 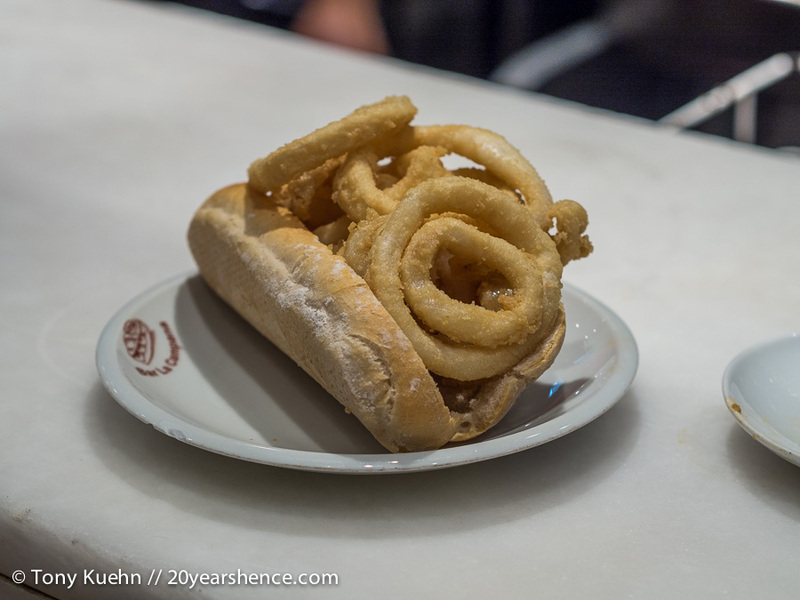 Our piggishness with the churros was our tipping point with food in Madrid. Everything we ate was SO good, but it was also SO rich. We wanted to keep trying everything and stuffing our faces, but we worried our cholesterol levels wouldn’t be able to take it and we might wind up limping to Lisbon with gout if we kept up our decadent ways. So, we decided we’d do one massive food bender in a self-guided tapas crawl and then go a bit easier on our pancreases. Quick internet research might suggest that you should head to Mercado San Miguel to kick off any tapas tastings in Madrid, but Tony & I disagree. Although San Miguel market is very swanky and slick and filled with many beautiful food stalls, we found it quite touristy and really overpriced compared to most of Madrid’s restaurants. We certainly enjoyed wandering around gazing at all the mouth-watering displays, but ultimately it was a feast for our eyes and nothing more. 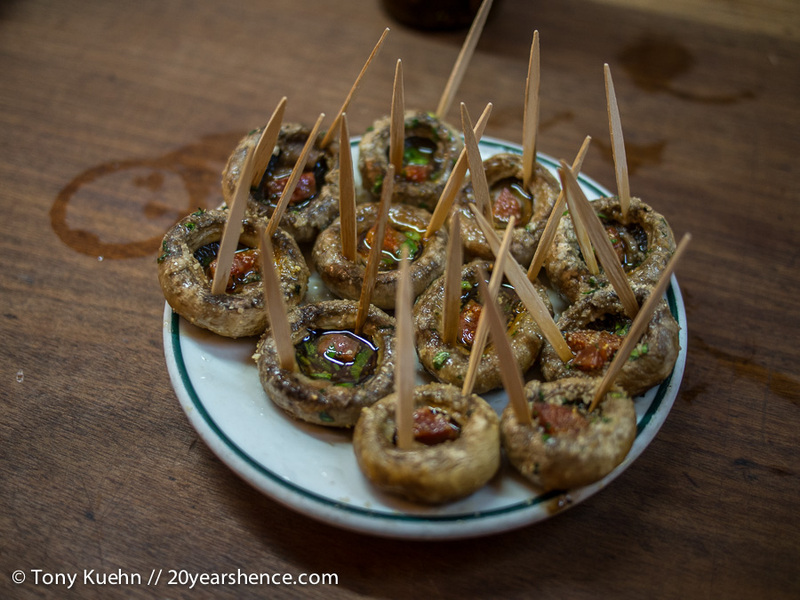 Instead, we kicked things off at the nearby Meson del Champiñon, where we stuck with their specialty and ordered the stuffed mushroom caps. Brimming with garlic, butter, and a nugget of chorizo sausage, these little calorie-bombs were every bit as good as you would expect. We then wandered (slowly) over to one of the city’s trendiest neighborhoods, La Latina, which is packed with hip and happening tapas bars. 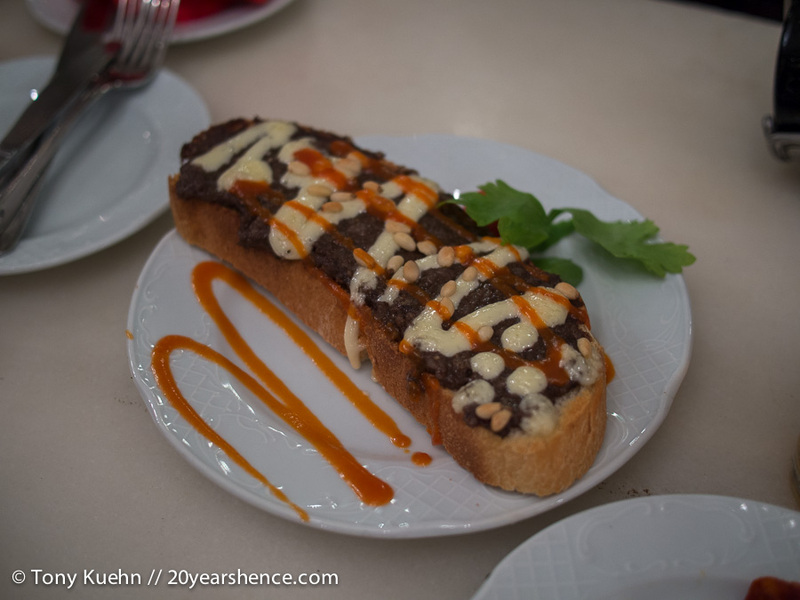 We popped into La Perejila because of how cute and quirky it was and ordered up two cañas and toast slathered in blood sausage and pine nuts, and then lightly drizzled with creamy cheese and spicy pepper sauces. The food was tasty and the joint was jumping! Regretfully, after just two stops, our stomachs were close to bursting so we decided to wind up our tapas crawl with a stop at Taberna Almendro 13. I’m so glad that we persevered and saved a little space, because the dish we ordered here was probably my favorite discovery in Madrid. Famed for their huevos rotos, we ordered up a plate of crispy homemade potato chips that were covered in soft-cooked eggs and crispy morsels of ham. So, so good; on a return visit to Madrid, this dish would probably be the first one that I would seek out! Perhaps it’s not surprising I loved this since, as a Canadian, I kind of think of this as Spain’s poutine. I know it seems like three tapas split between two people would not be an overindulgence, but in many places we were really being served raciones, which are larger portions rather than just a few mouthfuls. AND because we ordered drinks at every restaurant, our bellies were being filled with beer as well as the complimentary tapas (generally olives, but sometimes sausage, and nuts) that accompany every drink order. I’ve heard that in some cities in Spain you can easily make a meal out of the tapas (or pinxto/pincho) that you get, but Madrid seems a bit miserly on that front as the tapas were generally more like the free snacks bars are sometimes required to give out in North America. And sometimes, as in the case where we were served mini microwaved hotdogs (the worst thing we ate in Madrid! ), they can be downright odious! Following our big night out, we self-catered the majority of our meals as it must be said that as delicious as Spanish food is, it can also be very rich and heavy too. We found ourselves craving vegetables and the fresh, lighter flavors of Asian cuisine… something we probably could have indulged in, since Madrid has a limited number of foreign eateries, though perhaps not so many as you would expect from a capital city. Our AirBnB hosts actually told us that they generally head to Barcelona when they feel the need for the beach and Vietnamese food, so that should tell you something about the state of foreign food in Madrid. During our visit, it looked like the city’s first Vietnamese restaurant had recently opened up, but we were worried that we would likely find it disappointing and decided to skip it. That was probably for the best, and we limited our final two restaurant adventures to cuisine slightly more in Spain’s wheelhouse. Based on this recommendation, we headed to La Tona for Andalusian food (and their fantastic Thursday lunch special) because—like many great food nations—different parts of Spain have different specialties and iconic dishes. Since we wouldn’t have time for a trip down to Seville as we had originally hoped, we figured this was the next best thing. We ordered patatas bravas (crispy fried potato chunks dressed with a spicy, tangy tomato sauce), tortillitas de gambas (chick pea fritters with bits of shrimp in them), and a torta serranito (sandwich filled with Serrano ham, beef steak, and grilled green peppers). Everything was excellent and, once again, we had more food than we could reasonably finish. My favorite was probably the tortillitas de gambas, which actually reminded me a bit of Thai fish cakes (but without the curry/herb flavors)! 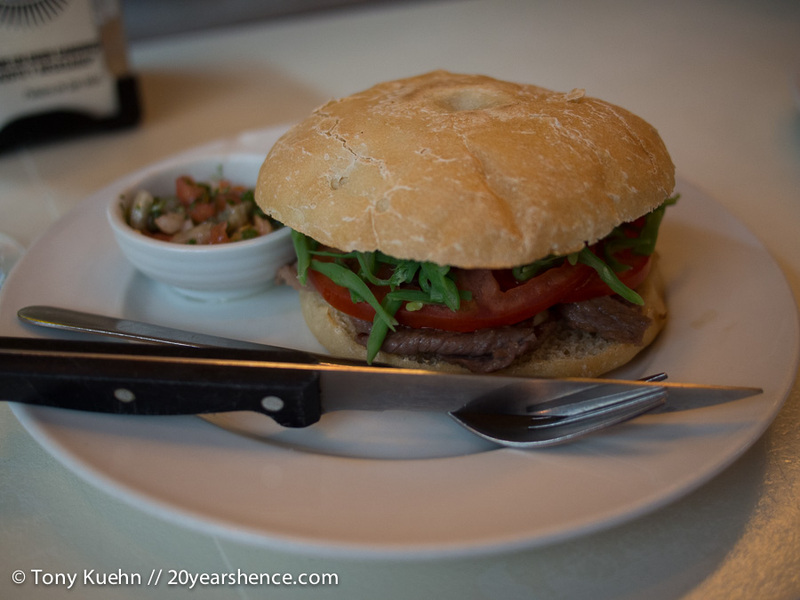 Then, on the recommendation of our hosts, we checked out San Wich, a Chilean burger shop that is beloved by Madrileños. I ordered the grilled chicken burger (called the Valadora and topped with melon chutney, grilled zucchini, tomatoes and leafy greens) because it sounded vaguely healthy, while Tony ordered the Chacarero which featured thinly sliced steak, covered with green beans (?! ), tomato, mayo and a spicy salsa on the side. 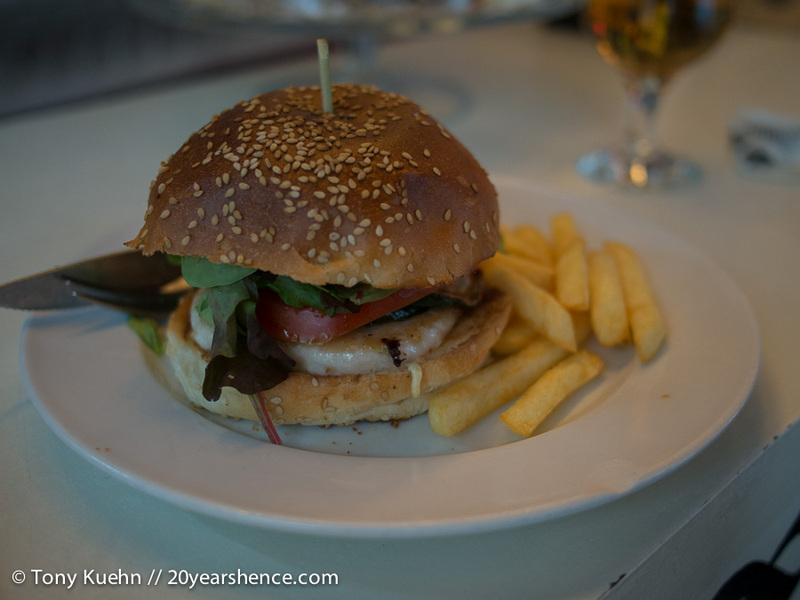 While I wouldn’t go so far as to say these were the best burgers in the world (or even the best burgers we had ever had), the food was fresh and tasty, and we were grateful that it was much lighter than the traditional Spanish cooking we had been sampling! Not every dish we tried in Madrid was a winner, but I’m happy to report that the overwhelming majority of the food we sampled was delicious and enjoyable. We may have overdone it on decadent dishes slightly, but we had so much fun trying all the new, novel creations that it was hard to exercise restraint… and we still only dipped a toe in the deep waters that make up Spanish cuisine. You could probably spend a year in Madrid and hit up a different restaurant or tapas bar and try a new dish every night. I’m confident we left the city five days later several pounds heavier—than when we arrived and certainly far more satisfied than we felt after eating our way through other European capitals like Paris or Rome. And for all the people who dismiss Madrid as having nothing to do? Hopefully this post disproves that notion pretty handily. Spend your time eating all that you can and I’m fairly certain you won’t be disappointed… or have the motivation to do much else! Now it’s your turn: If you’ve been to Spain, what is your favorite dish that you’ve tried? If you haven’t, which of these dishes would you most want to try? I loved the food in Madrid! 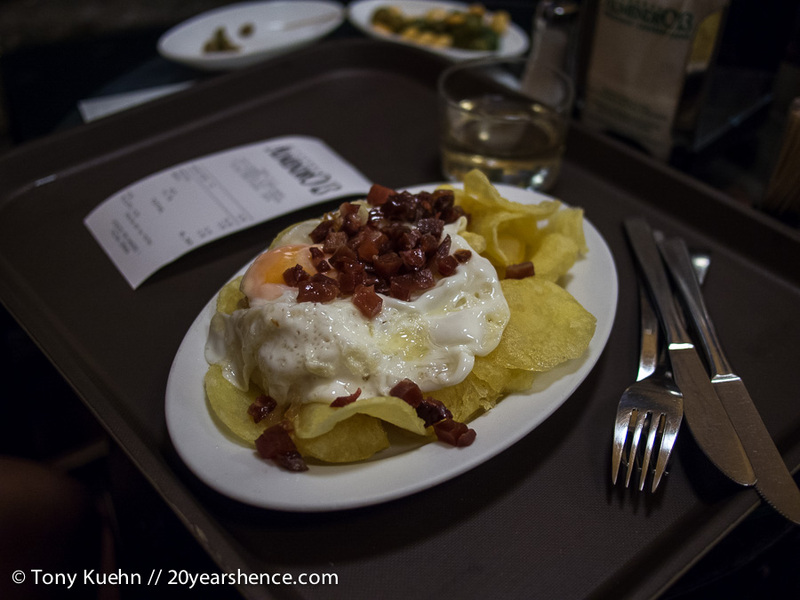 We stayed right in the Latin Quarter and one of my favourite memories is heading out with masses of locals bar hopping and having delicious tapas with our canas (we did get some duds but also got complimentary patatas bravas and beef stew in one case!) and splurging on crazy-aged jamon. The guy who sliced it for us pretty much does that for his daily work (crazy!). I heart Madrid. It sounds like you got way better free tapas during your bar hopping than we did, but I’m sure having locals who knew the best spots certainly helped you on the front! One reason I’d love to go back to Spain would be being able to spend more time getting make some local connections as they always improve even the best destinations. All of this looks AMAZING! Man those churros con chocolate are serious business, right?! I remember ordering some mid-afternoon on New Year’s Day. We weren’t hung-over, but we definitely were kept company by many who probably were – those churros do help I’m sure! We loved ‘tinto de verano’ too, it was so sweet! We had a different kind of culinary experience in Madrid,but still stuffed or faces with delicious food (olives especially) and even managed to find a vegan Spanish omelette which was delicious! I think we have you to thank for tinto de verano, as I’m pretty sure you mentioned that we should look out for it when we met up in Rome. And vegan Spanish omelet? That I have to see! I spent my time in Madrid eating as well. Loved those mushrooms and tinto de verano so much. I think you missed out on the tortilla, though. You definitely need to try one with potatoes someday! It’s a favorite of mine. Such a shame you didn’t try the traditional potato tortilla as it really is very good and so different to quiche. I can’t imagine cold zucchini would be nice. Those stuffed mushrooms look incredible! Perhaps there is something to the potato & egg combo, since you are the second person to tell us that we missed out by skipping the traditional duo of ingredients. For now I still say I prefer quiche, but I guess the next time we’re in Spain (and there will be a next time! ), I will have to try out the traditional Spanish tortilla and see if the potato makes all the difference! Hi Steph, another mucho delicious post. Your food shot looks so real that I can seem to taste and smell them. It has been a long long while since I visited Madrid but I remember those wonderful places in the side streets. I remember stuffing myself with lots of tapas and paellas. It looks like they modernized San Miguel Mercado. It didn’t look that slick from what I remember. Anyway, I hope to return to Madrid soon. When I do, I’ll definitely check out Meson del Champinon. Those stuffed mushrooms look to die for. I’m not surprised that the modernized San Miguel market is fairly recent, and I suspect that we probably would have liked it a lot more before the renovation! It was certainly fancy and slick (as you so rightly put it! ), but it didn’t really feel like it had that much soul or that locals would really go there to shop/eat… more like a food court in a really fancy mall. I hope you get to revisit Madrid soon. It’s really a wonderful city, and an excellent place to go on food adventures (especially when those mushroom caps are involved!). Yummmmmmmy! Everything looks delish. I especially like the stuffed mushrooms and the crisps covered with a fried egg. It’s been years since I’ve been to Madrid (I’m more a Barcelona girl!). My favourite dish was in a small local cafe somwhere in Madrid, packed with locals. It was a butchery and the slaps of meat were just hanging down and you ordered a variety of slabs and then went for it. I’m not a big “red” meat eater but I really like Spanish flavoured cuts. It was that long ago that everyone was smoking. We were the English-speakers and the only ones who weren’t smoking, and with small tables packed shoulder-to-shoulder, people shouting and constantly standing, and stretching over each other as we ate, we soon had to leave. It was far too smoky for our comfort ,but the meal was unforgettable LOL! Victoria@ The British Berliner recently posted..You’re looking hot and wearing a fur coat Katie Holmes. Of course you are: It’s Berlin Fashion Week Autumn/Winter 2015! I’m a big believer that you can pretty much make anything better by putting an egg on it, and those huevos rotos are a perfect example of this principle in action! Those were probably my favorite dish that we tried, but truthfully most everything we ate in Madrid was good. Ah yes, Pareeee – cigarette paradise! Thank goodness, smoking in public places has been made illegal. It used to be god-awful going out…! Victoria@ The British Berliner recently posted..How I can afford a life of travel. Don’t choose. Have it all! At this point in our travels, I don’t think anything is really off limits for us in terms of breakfast food (though we’re not really fans of fish early in the morning), so eating dessert for breakfast didn’t really faze us. I don’t think I could do it every day, though, and certainly not in the quantities that the locals tuck away! I had 5 days in Spain a couple of years ago and of course had to do BOTH Barcelona and Madrid. Loved every minute of it. Had the churros at the same place… kind of beats Costco’s, huh? But yeah, TOO SWEET and TOO MUCH. It took a pretty picture and left half the order on the table. Cry. I simply loved everything about Spain. Let’s do our next meetup there, k? Yes, I don’t think I could do churros every single day for breakfast! Maybe a once/week treat, but they are so rich it really was like eating dessert for breakfast! And we really loved Spain, not just for the food, though that certainly helped! Definitely a country we’d like to revisit and spend more time exploring. Being a pure Vegetarian, I guess I would have a pretty hard time over in Spain!! I think if you put in the effort, you can still eat well as a vegetarian in Spain, though it’s certainly not as easy as it is for us omnivorous folk! We didn’t go out of our way to look for vegetarian food, but if you can eat eggs, then you can enjoy things like tortilla and possibly even huevos rotos (if you can get them to hold the ham!). And yes, churros con chocolate will fill you up very easily! Huevos rotos, FTW! So simple but soooo good. Now I’m kind of wondering why I haven’t made them since we’ve been home… Need to rectify that fast! So… it wasn’t until I read your post that I realised I actually know nothing about Spanish food! I mean, the words “tapas,” “sangria” and “paella” are firmly in the vocabulary, but basically, this was all new to me!! It does seem pretty heavy and rich though… was there anything you had that was equally delicious and satisfying that was light? We really knew nothing about Spanish food either, but Madrid was an excellent place to just dive in and learn all about it. As for light Spanish food… I’m sure it exists, but I can’t honestly say we experienced any of that while we were there. Probably the lightest dish we tried was the zucchini tortilla, but by and large, the Spanish food we encountered was very rich and heavy. I love food and one thing that I really don’t mind is to gain weight! as long as I can try to eat new food in a new place which a must do for me when I visited other places. The stuffed mushroom caps really caught my attention. Got to list Madrid in my bucket list so I can try the food that you ate. Well, if you’re not worried about gaining weight from eating all the local fare, then Madrid/Spain is certainly a good destination choice! Those mushroom caps are bitesized, but if you eat enough of them, you’ll definitely pack on the pounds! Those mushroom caps alone are enough to make me wish that we hadn’t missed Madrid when we were in Spain!! Where are you guys and what are you eating!! It has been long since you posted! Sorry for the long absence, Arti! We are currently in Mexico where we have been eating very well and have resumed updating the blog again! Expect lots of yummy posts on the horizon! You know, I didn’t get Spanish tortillas either. It’s egg and potato, big deal, right? I mean, it was fine, but not worth all the hype in my opinion — especially when there are so many better dishes to try (as you’ve clearly demonstrated)! Finally! So glad there’s someone else out there backing me on the lack of tortilla love. Not terrible, but nothing too exciting either. I’d much rather save my stomach space for those sausage-stuffed mushroom caps again or the huevos rotos (now that’s how you do eggs right! ).